Preparations for the 58th annual St. Margaret’s Hospital Guild Decorators’ Show House and Gardens are underway, and the house will be ready for public tours beginning Saturday, April 27th through Mother’s Day, May 12th. As has been the tradition, each spring local interior designers, landscape designers, and their support teams donate hundreds of hours, as do the members of St. Margaret’s Hospital Guild, to refurbish an area home and its surrounding property. All ticket and tour proceeds benefit Eskenazi Health. We encourage you, your friends, and your family to attend this unique event, where local designers transform blank walls and empty rooms into extraordinary canvases of art and décor, while landscapers create lush gardens and outdoor living spaces. Your tour will begin with our printed program, which highlights each of the rooms with a before and an after picture, a detailed room description, paint colors, and designer information. We are excited to announce an audio tour is available for the first time this year! At the conclusion of your tour, we encourage you to visit our Café Maggie for a light lunch and our not-to-be missed famous homemade Maggie’s Bars. Finish out your day with a stroll through our Maggie’s Flower Shop and various boutiques, where you can purchase fresh spring florals and gifts. 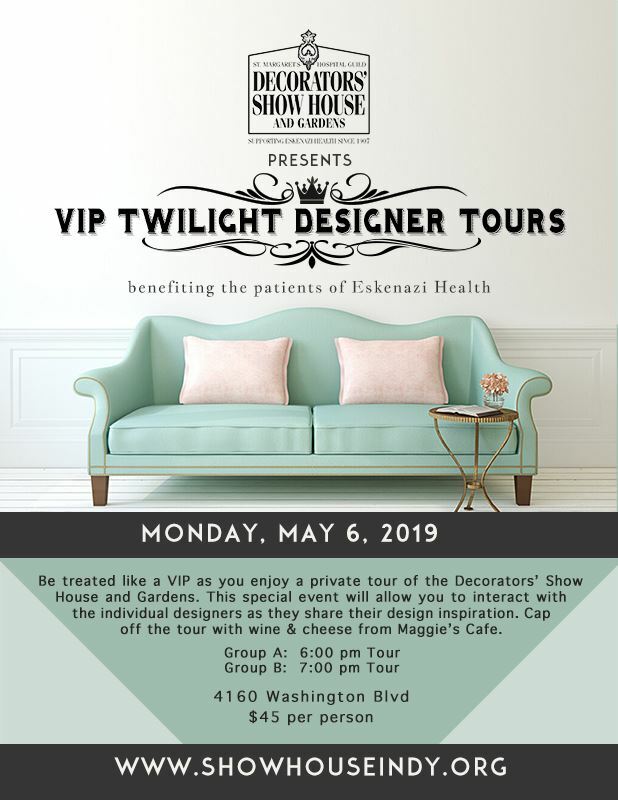 This 100% volunteer initiative has raised over $13 million for Eskenazi Health and is the longest-running decorators show house in the nation. 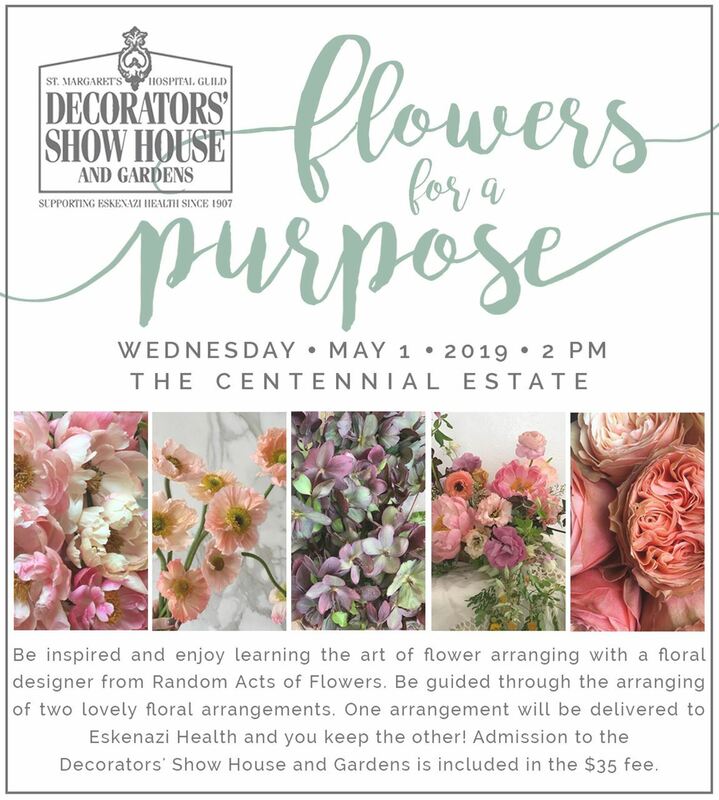 Over the years, the proceeds from the Decorators' Show House and Gardens have funded countless programs and projects for Eskenazi Health; proceeds from this year's event will support our three-year commitment to the nursing program. 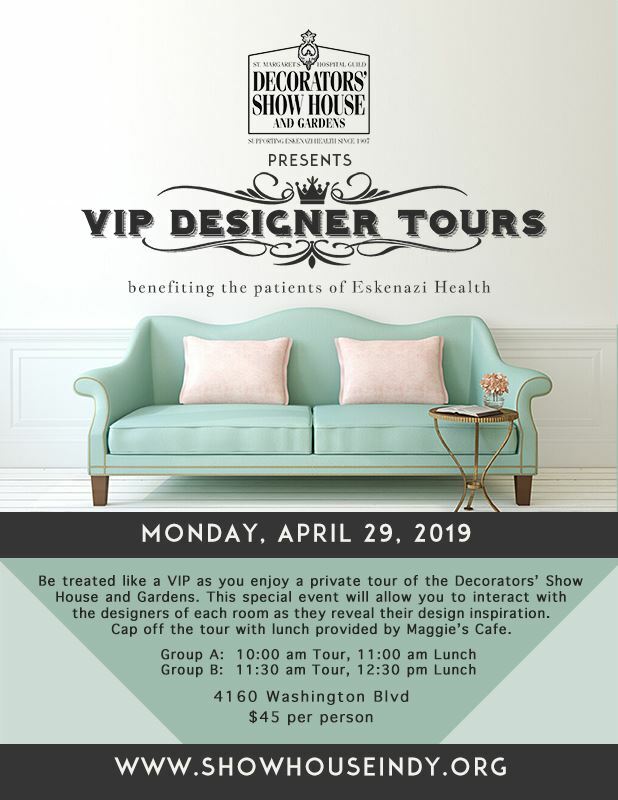 We thank you for visiting our website, and we hope you will tour the Show House and attend the related Show House events, all of which make our contributions to Eskenazi Health possible. On this day, St. Margaret's Hospital Guild is celebrating and showing our support for First Responders with a special day of appreciation. Discounted single purchase $15 admission tickets are available at the door with proper ID. On this day, St. Margaret's Hospital Guild is celebrating Nurses and showing our support with a special day of appreciation. Discounted single purchase $15 admission tickets at the door with proper ID. Great form and design is not exclusive to the Show House. World renown Dallara in conjunction with the Indy Racing Experience will have a one-of-a-kind Indycar on site featuring the St. Margaret’s Guild Decorators’ Show House and Gardens logo. Enjoy it’s design and take your picture with the car during your visit to The Centennial Estate. Meet Mina Starsiak Hawk and her mom, Karen E. Laine, stars of HGTV's Good Bones representing UKUTA Wall Art. Café Maggie features delicious lunches, drinks, and St. Margaret's own signature pastries! Be sure to stop in after your tour. Gifts, clothing, and beautiful flowers -- find them all at the Show House!